TJ Moore writes mystery fiction about eccentric characters, magical places, and supernatural events. Moore is the author of the CSI thriller novel Mind Games, fiction story collection Smoke and Mirrors, and feature-length screenplays including Special Delivery, Slick and Vector. He lives in North Hollywood, CA. Claire Doolittle is an illustrator, currently residing in Fargo, North Dakota, who specializes in a variety of art mediums. 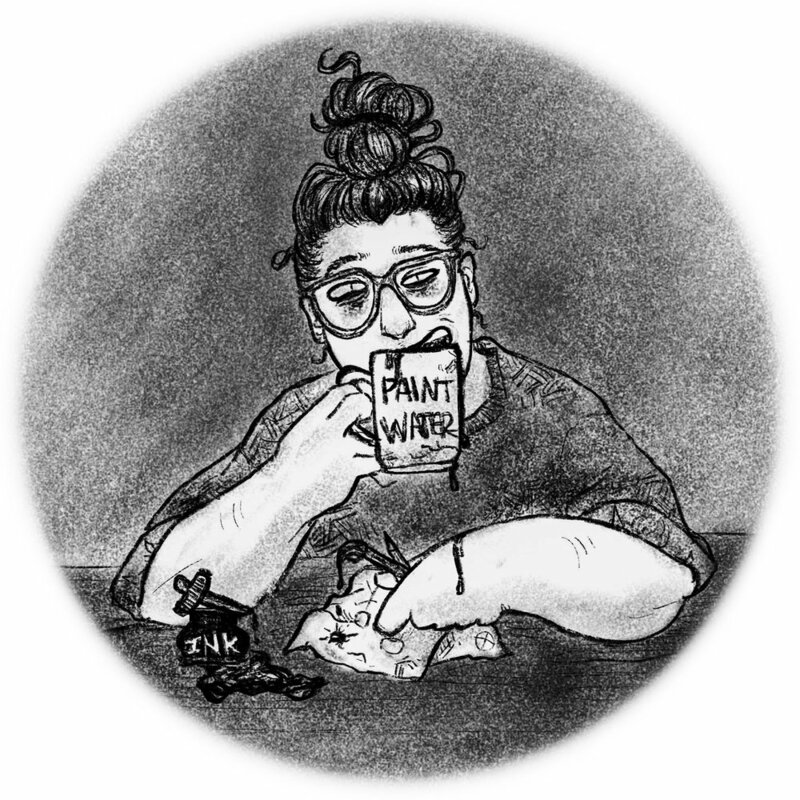 Her recent ink wash illustrations are featured in the new fiction collection Smoke and Mirrors. When she is not drawing, Claire is often found eating Indian food, watching anime, or cleaning her fish tank. In a world where it’s exceptional to find a young author, TJ Moore, a USF Media Studies Marketing student, is publishing a novel while finishing his undergraduate degree this year. Moore makes his entrance to the literary circle with Mind Games, a mystery thriller set in the city of San Francisco. On Tuesday, October 13th (2015), the members of the USF community can get their hands on a first edition copy. Moore says he acquired a fascination for mystery and suspense at a young age. “Even when I was young, I was inspired by mystery and what’s around the corner. I was really interested in magic tricks growing up because they make people smile and there’s that question of what’s going to happen next,” Moore says. In writing Mind Games, Moore used his personal interests to help spark his creative process. It was important to him that his work expressed his interests. Included in his novel are examples of his curiosity towards the criminal justice system, forensic psychology, and CSI work. For a number of characters, Moore placed emphasis on the motives. “Because there are places I want to go in the scenes, and things I want to say – they’re not things I would say, and they’re not things I would do, but as the storyteller it’s a platform to let those things happen,” Moore says. Works by authors such as C.S. Lewis, Dean Koontz, and Stephen King inspired Moore and helped put this project into motion. Instead of personalizing the story, he worked diligently to allow the characters and the story to naturally develop. Moore placed an emphasis on not dictating the plot, but rather letting the character manipulate the story. Moore says he remained organized throughout the process because of his deliberate use of foreshadowing. Being knowledgeable of what was to come later in the book was invaluable in forming his mystery-thriller style. “You cannot rely on inspiration or your mood. You have to sit down and write,” says Moore. Moore says this novel proved to be a tremendous learning experience; one of the biggest takeaways being character development. Moore’s discovery about making readers love the characters allowed him to have freedom with individual character developments while still enticing readers to continue. In addition to writing, Moore has written and directed several feature films including Special Delivery, Slick, Vector. In order to bring realism to his fiction, he studied Forensic Psychology and interviewed detectives. Be on the look out for TJ Moore’s Mind Games available first on Amazon on Tuesday, October 13th (2015) at 10AM in the Jeschke Fine Arts. Mind Games is also available as an eBook on the Amazon eBook/Kindle store. Moore would like to extend a special thanks to Jodi Andrews for editing his novel and USF Alumni Kaitlynn Wornson and Cassandra Swenson for their help in the publishing and marketing process. The play may be the thing for Shakespeare, but Brookings native TJ Moore has gone from films to writing books. Mind Games, Moore’s first foray into novels has been available on Amazon.com since Oct. 13, 2015 as a paperback and has been getting high praise from readers. The story follows Cameron Frost, a CSI photographer who discovers San Francisco citizens are disappearing and sets out to solve the case. “TJ Moore’s novel Mind Games pulled me in on the very first sentence and kept me intrigued and frightened throughout the entire book,” wrote one Amazon customer. “This book was an adrenaline rush from almost the beginning!” wrote another. “Totally amazing suspenseful, twisted book,” wrote Miranda Kelly on the Facebook page for Mind Games. “In one word: suspenseful,” Moore said of his creation. “I also describe it as a beat-the-clock thriller because there’s a time element involved.” Growing up in Brookings, SD, Moore was known for his films more than his writing. “My sister (Jodi Andrews) and I grew up writing plays,” Moore said of his start. “Many of my interests have been rooted in film. I made a documentary when I was in fourth grade. That’s where it started.” He listed Becky Ekeland, Sharon King, Ricky Ganci and Chad Caldwell as teachers who had an influence on him. “Each one has been encouraging and inspirational and supportive for the screenplays,” he said. The first three were English faculty; Caldwell teaches honors chemistry and human anatomy, “more of a personal friend,” Moore said. “When I wrote Vector, it had science elements, and that was where he helped me,” he added. Moore wrote, produced and directed five feature-length films, with the last three: Special Delivery, Slick, and Vector being shown at Cinema 5 before he graduated from Brookings High School in 2012. He managed casts of 20-25 people for each film. While it was a lot of work, he enjoyed it. “Yes, it’s kind of like the time of my life, making those,” Moore said. “He went on to the University of Sioux Falls, where he is wrapping up a major in media marketing and working for Magic Makers Inc., where he is part of their design team. His background in film and his current studies led him to writing the book. “I like to experiment in different mediums. The storytelling is the most important part for me,” he said. “I never thought I would write a book simply because film is my favorite medium to consume. It really stemmed out of my love for the mystery genre. Reading should never be a boring experience,” Moore said. These days, people are used to getting information instantly he pointed out. “Mystery has a way of grabbing readers for longer forms of writing,” Moore said. He chose San Francisco as the setting because of the contrast between the city and the area outside the city. “San Francisco has fascinating structural history,” Moore said. “I don’t have the budget to film in San Francisco. With books, I can have a story take place anywhere,” he added. A couple of his goals with the book were to “infuse the plot with a very character-driven story” and since he likes fast-paced reads, “that’s what I tried to do with this.” Real life found its way into his story. Moore has taken forensic psychology classes. “One dealt heavily with motive and procedures (officials) use to prosecute criminals accurately,” Moore said. He did research by extensively questioning police detectives and infusing their answers into the story. “I tried to bring a big sense of authenticity, such as false leads,” he said, since that’s the way it would be in real crime solving. Since this was my first attempt at this medium, I was a little shell-shocked at what it took to complete,” he said. It took three months for him to write Mind Games; then he wrote different drafts and did revisions. “I can confidently say this process gave me a deeper respect for people who choose writing as a profession,” Moore said. “The writing process opened my eyes…I have more understanding of what drives authors, and what haunts them as well. Now that the book has come out, it’s great to have the feedback from people who supported me growing up,” Moore said.